INVENTORY, Tape Dispenser, Shrink Wrap, Sticky Doos, Cellophane Rolls, Cellophane Bags, Foil Wrap, Gift Tote Bags, Baskets, Containers, Coffee Mugs, Boxes, Trays, Ribbons, Bows, Shred, Tissue Paper, Package Enhancements/Adornments, Scissors, Ribbon Shredder, Calculator, Clipboard, Ink Pens, Calendar, Roll of adding machine tape, Thank You Notes, Gift Certificates, be sure to visit www.mygirlfriendshouse.com for live video clips and a complete list of what you will need. You will also find many gift wrapping examples and ideas!! Congratulations, Happy Birthday, Thank You, New Mother or Father, Weddings, New Home, New Car, etc. **Be sure to put gift certificates (with $5 or $10 toward a purchase) and your contact information in all gifts, so the recipient can become a new customer as well. **Get to know your customers: Name, City, Job, Married, Children, do they give gift baskets or receive gift baskets??? **WHO ARE YOU GOING TO SELL TO?? This list may take time to complete, you will not think of everybody at once, so keep the list ongoing. **Here’s a start: Current customers, Business Owners, Corporations, Hospitals, Independent Professionals, Insurance Offices, Hotels, Real Estate Companies, Car Dealerships, Schools, Dental Offices, Doctor Offices, Law Offices, Construction Companies, Utility Companies, Women’s’ Clubs, Accounting Offices, Chamber of Commerce Offices, Event/Meeting Planners, Casinos, Theaters, Colleges, Churches, etc. **Watch the newspaper for upcoming events, promotions and ads; these can also be great leads. **Ask every business you are working with if they have an employee of the month? **Keep your photo wallet with you at all times, to show everyone examples of your gift packaging. **Get to know the gift giver’s price range and be sure to let them know you have gifts of all price ranges. **Keep business cards, samples and literature in cellophane self-sealing bags ready to pass out everyday, everywhere you go. Please remember fitting suggestions are based on what literature and products we have in our hands. To be 100% sure of a fit, measure your brochures/literature. Our bag measurements are the area that you can fill and does not include the sealing flap. IMPORTANT TOOL - Self-Sealing Bags can be mailed!! Clear Only: Clear Self-Sealing Flat Cellophane Bags - We have some additional sizes in our clear self-sealing cellophane bags. Choose from very small of 2.5" x 5" up to as large as 16" x 20". Printed Designs: 2.5" x 5" Biz Card Self-Sealing Cello Bags - Great way to present your business card, add a small sample or a piece of candy…sweet way to introduce yourself. 3" x 5" Self-Sealing Flat Cello Bags - Flat Cellophane bags also referred to as Literature Bags or cello envelopes. Use these self-sealing cellophane bags for beauty brochures, color swatch cards, samples and business cards. 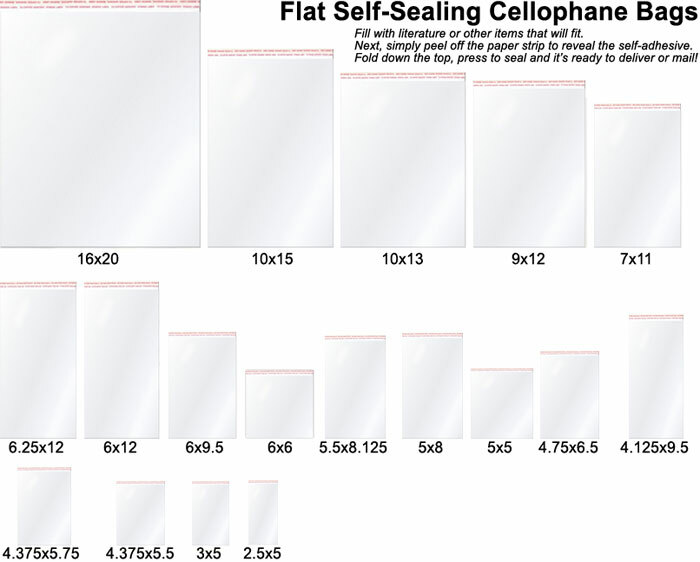 4.375" x 5.75" Self-Sealing Flat Cellophane Bags - are a nice fit for your hand stamped 4" x 5" greeting cards. 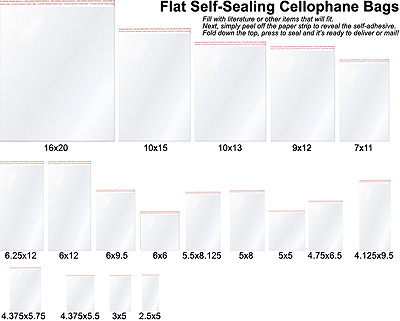 Printed 4.75" x 6.50" Self-Sealing Flat Cello Bags - This size self-sealing flat envelope is perfect for a stamped greeting card or literature. Also referred to as Literature Bags, you can use these cellophane bags for anything up to approx 4.5" x 6". 5" x 8" Self-Sealing Flat Cellophane Bags - Can be Mailed. The following will fit in this size bag: Passion Parties®Brochure , PartyLite® Summer Catalog (folded like a business letter). 2014 thirty-one® mini. Note: thirty-one mini will also fit in our clear 4.125 x 9.5 bags. 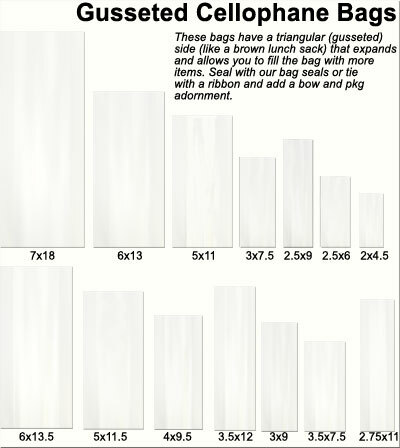 6.25" x 9.5" Self-Sealing Flat Cellophane Bags - Can be Mailed. The following will fit in this size bag: Mary Kay®Beauty Book. This size works great for regular sized paper that is folded in half to a size of 8.5 x 5.5. 6.25" x 12" Self-Sealing Flat Cellophane Bags - Can be Mailed. The following will fit in this size bag: Cookie Lee®Brochure and PartyLite® Simple Summer Ambiance Brochure. 7" x 11" Self-Sealing Flat Cellophane Bags - Can be Mailed. The following will fit in this size bag: MaryKay®Look Book, Story Time Felts®Brochure, Accentz®Brochure, Jewels by Park Lane®2007 Collection and Tupperware®. 9" x 12" Self-Sealing Flat Cellophane Bags – Can be Mailed. Perfect for recruiting packets, hostess packets & more. Fits most brochures and additional information. The following will fit in this size bag: All Avon®Brochures, BeautiControl® PartyLite® Everyday Catalog, Wineshop at Home®, Mary Kay®literature, lia sophia®literature, Jordan Essentials®, Homemade Gourmet® 2008, Stampin' Up!®Idea Book & Catalog and Stampin' Up!® Seasonal Catalogs. 2014 thirty-one® catalog. 2.5" x 6" Gusseted Cellophane Bags: Great for small product samples, business cards, introducing yourself/product & much more. 3.5" x 7.5" Gusseted Cellophane Bags: Perfect for larger samples, small hostess gifts, giveaways, small gift with purchase & more. 4" x 9.5" Gusseted Cellophane Bags: Use for larger products, 1-2 smaller product deliveries, tying with a bow & making customers feel special. 5" x 11.5" Gusseted Cellophane Bags: Great for regular size coffee mug with product in it, 1-3 product delivery and remember…tie it with a bow to make your customers feel special. 6" x 13.5" Gusseted Cellophane Bags: Holds large 26 ounce jar candle, spa sets, skin care sets, larger product deliveries & sooo much more!! 7" x 18" Gusseted Cellophane Bags: Put a cute stuffed bear, toy or even a small basket in this big bag.